OFFICIAL LICENSED WINCHESTER AMERICAN LEGEND LOGO: Features a Cowboy Western design poster with Winchester's slogan "The Gun that Won the West" and iconic Horse & Rider Logo on the front. An original FSD Design for Winchester. PULL OVER STYLE MADE OF 50/50 COTTON POLYESTER BLEND - This midweight 50/50 hooded sweatshirt that is ideal for wearing on its own and its perfect & roomy enough as a layering piece for everyday wear. EASY WASHING INSTRUCTIONS - Keep your hooded sweatshirt fresh + feeling new by following these instructions: machine wash cold with like colors & only non-chlorine bleach when needed & tumble dry low. 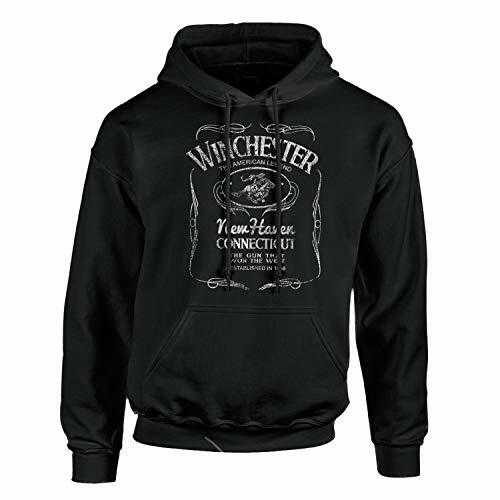 OFFICIAL WINCHESTER APPAREL FROM FOUR SEASONS DESIGN - Each & every apparel item sold from Four Seasons Design is approved by Winchester as the official authorized seller of Winchester Apparel in USA.